An accessory set to expand your range and capacity of your standard NOVA chuck for specific projects and applications. Universally fit any NOVA chuck for maximum flexibility and savings. Includes: Mini Spigot Chuck Jaw set, Mini Step Chuck Jaw set, 2.75 in Chuck Jaw set, and the 0.78 in. Mini Chuck Jaw Set. All four sets have a dovetail profile (maximum holding strength without damaging wood fibers) and can be used in expansion and contraction modes. Machined from a single solid piece of 1045 high tensile steel. Each jaw set offers precise closing and durability. Universal Mini Spigot Chuck Jaw Set has a long nose to allow for very powerful spigot grip for smaller work such as lace bobbins. 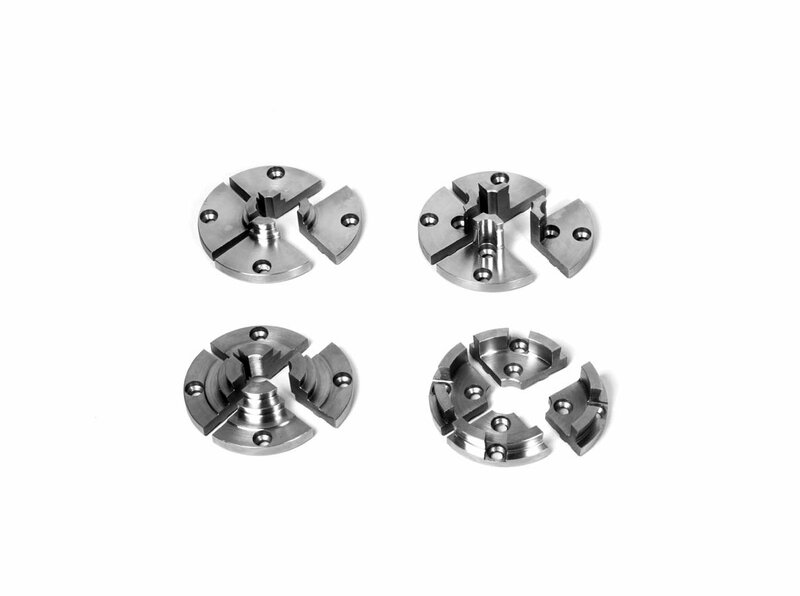 Universal Mini Three Step Chuck Jaw Set has three steps providing optimum gripping of three base sizes with minimal crush damage to the wood, and has an internal spigot grip to hold small unsupported or supported spindle work. A 2.75 in. Universal Chuck Jaw Set is perfect for bowls and spigot projects with expanded and reverse dovetail design. The 0.78 in. Universal Mini Chuck Jaw Set is ideal to use on midi and mini lathes to hold and turn small bowls and unsupported small spigot pieces.